When Hayley Wickenheiser sees girls dragging hockey bags into arenas, she feels a sense of accomplishment. The normalcy of girls playing hockey is what she sweated for, fought for, and shed tears for. When Hayley Wickenheiser sees girls dragging hockey bags into arenas, she feels a sense of accomplishment. The normalcy of girls playing hockey is what she sweated for, fought for, and shed tears for. When Wickenheiser started playing 33 years ago, there were no girls' teams. She played with boys and wasn't always welcomed by players or their parents. "The greatest stride's been made in the acceptance of girls playing the game," says Wickenheiser. "Any little girl in this country can walk into a hockey rink and no one is going to think twice or look twice. There's female hockey change rooms in a lot of rinks now." "I remember when I was a kid, I hid in the bathroom and tucked my hair up so no one would know I was a girl. I just went through hell really, to play. Girls don't have to go through hell anymore to play hockey." The fact that female hockey has arrived at this stage puts some soothing balm on the difficult decision to end her playing career. The country's all-time leading scorer announced her retirement Friday after 23 years on the Canadian women's team and almost a dozen Olympic and world championship gold medals. "Dear Canada. It has been the great honour of my life to play for you. Time to hang em up!! Thank you!" Wickenheiser posted on her Twitter account. Not only was Wickenheiser a star in women's hockey when the game desperately needed one, she changed perceptions of what women are capable of in sport. The 38-year-old from Shaunavon, Sask., told The Canadian Press in a sometimes tearful interview she didn't want to postpone her entrance into medical school any longer. "It has been the greatest honour of my life to play for Canada," Wickenheiser said. "I'll miss it." The number of registered female players in Canada went from 16,000 in her first year on the national team to almost 87,000 today. Bob Nicholson, who was Hockey Canada's president and chief executive officer during most of Wickenheiser's career, said she played a big role in giving "girls the dreams that boys had." "Her record speaks for itself winning so many gold medals, but in years to come, the biggest memory will be how she inspired so many girls to play the game," said Nicholson, now CEO of Oilers Entertainment Group. "She always was harder on herself than any of her teammates and pushed herself to excellence." Her forays into men's professional hockey in Finland and Sweden set new standards on how much a woman can be pushed physically. She played a combined 65 men's pro games in Europe. Her decision to play with and against men wasn't unanimously supported at home. Some female teammates believed she should stay in Canada and help grow women's leagues here. But Wickenheiser made choices she felt would make her a better player, which meant leaving her comfort zones. She trained in her off-seasons with NHL players, making headlines skating in Philadelphia Flyers rookie camps when she was in her early 20s. "I'm comfortable being uncomfortable," Wickenheiser said. Danielle Goyette said Wickenheiser was a driven woman when they were linemates on the national team and when Goyette coached her at the University of Calgary. "She's the kind of athlete that never took 'no' for an answer," Goyette said. "What I mean by that is she wants to push the limits of women's hockey. "She didn't have to [train] with guys, but she always tried to train with somebody stronger than her to make sure that she's pushing herself to the max. "She went to Europe and played hockey with the men, full-body contact. I don't know a lot of girls who would put themselves through that." Hockey isn't done with Wickenheiser. There will be opportunities for her to work in the game. She said she's had discussions with people in the NHL, but there are no concrete plans yet. "I have to see how that all fits in with where I'm going in medicine and the rest of my life," Wickenheiser said. She was an Oilers fan idolizing Mark Messier as a young girl. Wickenheiser, who has lived in Calgary since she was 12, will be honoured in a pre-game ceremony Saturday in Edmonton before the Oilers host the Calgary Flames. "It's a celebration and of course it's really emotional," she said. "It's sad in some ways because you're leaving a part of your life behind, but it's also exciting in other ways. "There are other things I've wanted to do for a long time. I have other opportunities within the game and in medicine to pursue. I just didn't want to wait to do that." But there have been sleepless nights coming to that conclusion. 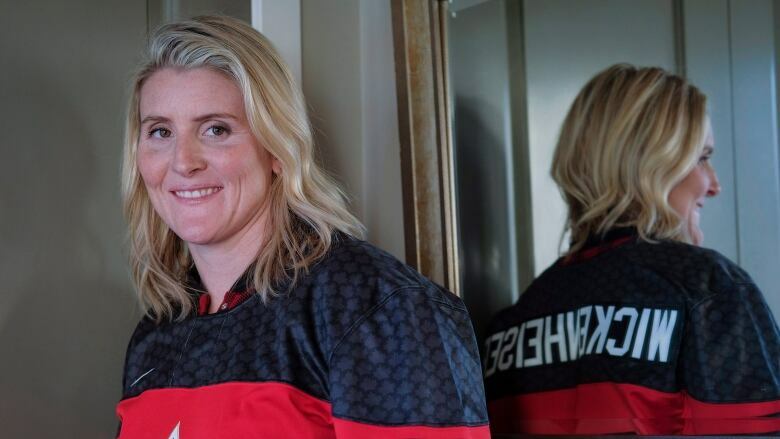 Just six months ago, Wickenheiser said she wanted to wear the Maple Leaf at a sixth Winter Games in 2018 and pursue a fifth gold medal. It would have been Wickenheiser's seventh Olympic Games as she also played softball for Canada in 2000. "It would have been great to play in one more," she said. "The more I thought about it, it would have been too long to wait." A five-foot-10, 171-pound forward with a heavy shot and creative hands, No. 22 was the dominant female player in the world in this century's first decade. Named MVP of the 2002 and 2006 Olympic women's hockey tournaments, Wickenheiser's 379 career points for Canada — 168 goals and 211 assists in 276 games — will be difficult to match. Wickenheiser is one of just five athletes in the world — joined by retired teammates Jayna Hefford and Caroline Ouellette — to win gold at four consecutive Winter Games. Wickenheiser intends to continue getting girls into hockey. She's now committing through her annual international female hockey festival Wickfest to fund 22 girls who otherwise couldn't afford to play. Wickenheiser is confident there will be a women's pro hockey league some day, with the NHL's help. Hockey is precious in Canada so Wickenheiser's message to the next generation is to take care of it. "Don't ask 'What can I get out of the game?' Ask 'What can I give to the game?"' she said. "Take everything you can from the game and give everything you can back to it and it will reward you well."